Language Humor, IndoEuropean and Beyond! 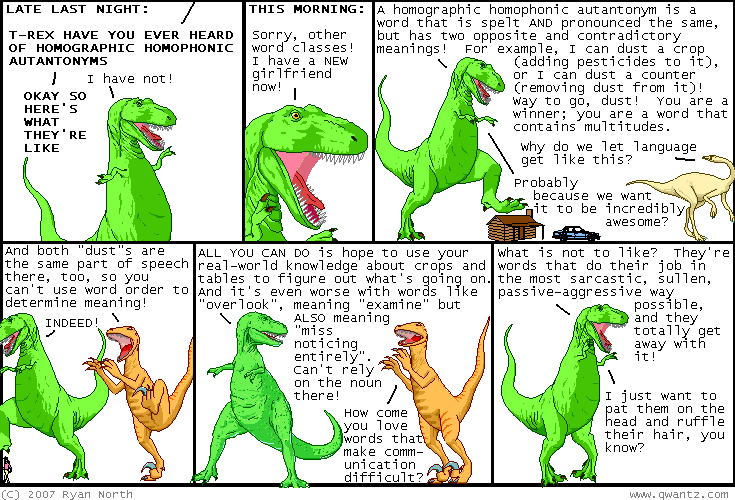 Below, find some humor on the degradation of language and how to combat it. Does Nine equal New?. If nothing else, it proves linguists have a sense of humor! Autoantonyms: words that are their own opposites ... really! Back to the Pure Language! Nigel Love wrote "my experience as a panellist on a radio programme fielding listeners' queries about 'correct' English may be relevant. ... When someone writes in complaining that they heard someone say/write, e.g, "who did you see?" instead of "whom did you see? ", I answer along the following lines [explanation of language evolution and the loss of pronomial case endings, etc, edited ... see the Pellissippi Parkway for some discussion on this (kmd)]. ... The response is to execrate me for letting the side down, benignly 'allowing' (or even contributing to) the barbarisation of the language, etc. ..."
And Bruce Nevin counters with this lovely bit of advice for us all: "The logical implications of their position can be made evident. An alternative tack, then, is to agree with them, and excoriate them for only now waking up to the degradation of language. Loss of the case endings has been going on for a long time, let's bring back nominal as well as pronominal inflection, genitive and dative at the very least. And imagine such a Frenchified form of the language being held up as a model in our schools as that represented in the writings of Shakespeare! What's in an ekename? Where's the beef, it's cow flesh from now on! But they are like the deaf nadder that stoppeth her ear. Reverse the great vowel shift! Back to our Indo-European roots! And beyond!" But don't look to me for a serious view about the Sapir-Whorf hypothesis. What do I know from language and culture? I have no idea whether my vocabulary shapes the things I am permitted to think; I only know that when I think something, the words to talk about it do seem to be there, except when words fail me. A couple of years ago, I was a TA for a History of Math course, in which the professor, who is a mathematician and amateur polyglot, told the class that there was a strong resemblance between the word for "nine" and the word for "new" in many languages, and that this was because (according to his theory) people got along with 8 numbers for a long time (because they had 8 fingers) and then needed a "new" number. He cited, of course, Spanish "nueve/nuevo" and French "neuf/nouveau", and even English "nine/new". So, the question to the class is: how many languages can we come up with that match this theory (however spuriously or vaguely)? Well, here's a great lesson in how "sounds are evil" and only history is good. many people pointed out that Latin had novem (nine) and novum (new) which became the Romance words. Of course, this all dates to the original Indo-European *newo/*newn, which pretty obviously leads to the rest... but what about non Indo-European languages? After all, they count on their fingers, don't they? Basque - berri/bederatzi ... but that's not real close, is it? And people have surely had ten fingers a lot longer than the Indo-Europeans were around, no? in Chinese, nine = old (jiu3/jiu4)!!!! And they write backwards, too! Words both have one syllable! Words would both be high-scoring in Scrabble! Words both have the same number of letters when transliterated into English/Latin alphabet! So, obviously, despite my college professor's theory that Europe was colonized by six-fingered aliens from outer space (which is why we have dozens instead of tens), it's obvious that it was four-fingered TOONS that ruled the earth in days gone by! Do you have any autoantonyms to add to the list? Darkest Africa, No one I knew, Mortal enemies, Briar patch, Dirty attic, Lobster Bisque, Dingbats, Barber of Seville, Hillbilly, Belly buttons, Standing ovation, Alley cat, Strawberry jam, Double chin, Chinese checkers, Blue chip, Traffic cop, Popcorn, Dernier cri, Creases, Up a creek, Shrimp creole, Rubber check, Prune Danish, Cellar door, Going dutch, Got in dutch, Protestant ethic, Body English, Reverse English, Wet nurse, Gall stone, Rolling stone, Itchy truss, Rotary fan, Photo finish, Nasal phlegm, Fox fur, Best friend, Deep freeze, Brimfull, Howling gale, Exravaganza, Figaro, Natural gas, Gorgeous George, Wheat germ, Cousin german, Indira Ghandi, Fenugreek, Sea gull, Full house, Milwaukee brew, Cornish hen, Westward ho, Bunny hop, Gnawing hunger, Take it easy, Rikki Tikki Tavi, Overhead cam, Swift kick, Protocol, Terpsichore, Overcoat, A capella, Flight crew, Chocolate cookie, Standup comic, National Lampoon, Last lap, Gelatin, Iceberg lettuce, Stove lid, Antimacassar, Chocolate malt, Gentlemen, Virgin Mary, Coal mine, Night nurse, Euphoria, Bosom pal, Shoo-fly pie, Stand pat, Another man's poison, Love potion, Pigeon-toed, Nail polish, Fools rush in, Shifting sands, Can of sardines, Alto Sax, Hopscotch, Yosemite, Original sin, George Bernard Shaw, Worcestershir, Hot tamale, Creases, Dying swan, Sickeningly sweet, Dotted Swiss, Dromedary camel, White tie, Hot tamale, Thanksgiving turkey, Christmas tree, Whooping crane, Electrocute, Resounding wails, Wishing wells, Cry wolf, Superhuman, Bronx zoo.